Editor’s note: In December 2015, two Army intelligence officers set out on a trip to explore the mysterious remnants of the Soviet Union in the Baltic States. In the first of this two part series, they showed War on the Rocks readers what they saw in an abandoned Soviet military city. In this part, they explore the remnants of the Soviet nuclear missile infrastructure in Latvia and Estonia. “Da?” (Да) muttered the broad-shouldered man behind the diner counter, eyes apathetically glancing at the television mounted in the corner of the room playing Russian pop music videos. The place was a far cry from a favorable Yelp review, but it was the only open restaurant in the isolated municipality of Gulbene. We occupied a table in the corner and noticed two other patrons giving us a piercing stare. It seemed we were more interesting to them than the scandalously-dressed teenage Russian pop-stars on TV, and the gaze lasted the full duration of our Latvian truck stop dinner. Our destination in the vicinity of this sleepy little town was an enormous subterranean Dvina missile silo complex, once the home of R-12 medium-range ballistic missiles (NATO designation: SS-4 Sandal) of the Soviet nuclear arsenal. Placed on the western edges of the Soviet Union due to their limited range of 2,000 kilometers, the Sandals could reach targets as far west as London. From their initial fielding in 1959 through the 1980s, the Sandals were the mainstay of Soviet nuclear missile forces in Europe, and became infamous in 1962 when 42 of them were revealed in Cuba. Four identical silos housed the R-12 missiles, with each kept at a different level of combat launch readiness in the event of nuclear war. Generally, decreased start-up time would be sacrificed for the missile’s shelf life in any configuration. For example, a moderate readiness level would allow the missile to be launched within one hour, and included inserted flight path data and initiation of the missile’s onboard guidance system. The drawback, however, was that the missile could only remain in such a condition for about three months due to technical constraints such as the expiration of Soviet guidance systems. 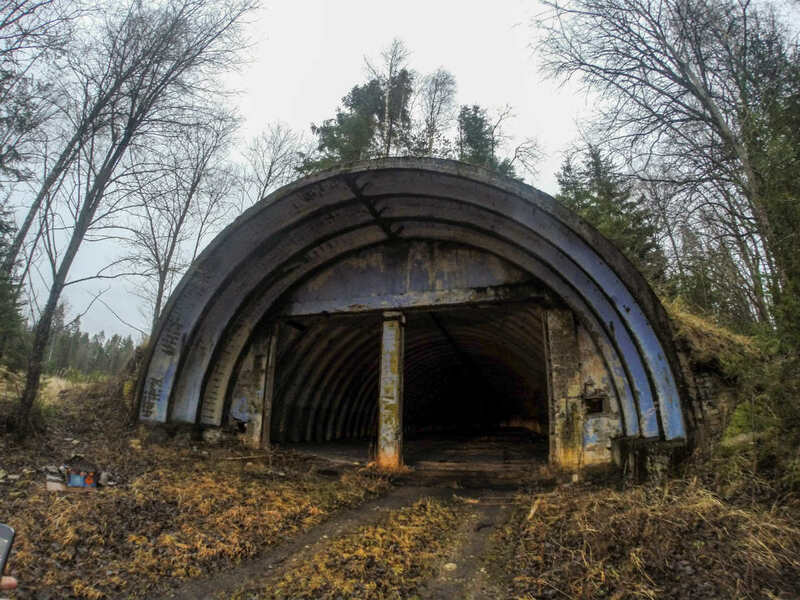 The nucleus of the complex was a centralized command bunker, which supported each silo through interconnecting corridors buried under an unassuming forest floor; a hub with four very lethal spokes. We later learned that BSP (БСП) was a Soviet an acronym for Boevaya Startovaya Pozitsiya (боевая стартовая позиция), which translates to “combat launch positon” and was the doctrinal term for Red Army missile firing sites and their support facilities. Today, the sign serves as a chilling reminder of the high stakes soldiers in the Soviet missile forces found themselves in. As the information and intelligence war waged on between the United States and the Soviet Union, it became increasingly imperative for missile soldiers to maintain the secrecy of their launch site locations, and enforce perimeter security by any means necessary. Most of the buildings in the deserted military base stood gutted and boarded up. 5.56 NATO bank shell cartridges littered the fractured floorboards against nearly every window, which were haphazardly fortified with the occasional sandbag or loose pile of bricks. Like many other sites we visited, Tirza was seeing a second life as a location for Latvian military exercises. Amid the current geopolitical tensions in the region, it wasn’t hard to picture Latvian soldiers firing rounds of blanks against a notional adversary who undoubtedly resembled the Russian Federation. Following the concrete road after our lonely parade down barracks row, the rapidly receding daylight urged us to proceed to the main event. The authors atop an SS-4 Dvina Missile Silo. A few hundred meters through the woodland, we found ourselves within a giant rectangular clearing and observed a gray dome peeking just over the ridge ahead. We scurried up the hill and climbed onto the first dome, where the higher vantage point exposed three other massive concrete lids, each the size of a suburban cul-de-sac perched above each silo. At the dome’s bleak summit was a rusting metal outer ring with an exposed center. Looking down the hollowed opening revealed a fifty-meter-deep silo filling with slowly filing with a slurry of rainwater, mud and various oils and lubricants from the complex’s operational period. Decades ago, this crumbling chamber once housed a deadly payload. Peering into the darkness, we could envision the sharp-tipped warhead of an SS-12 angrily pointing up at us. Briefly reflecting on this vestige of mutually assured destruction (and mindful of the 40-meter drop beneath the concrete we laid upon), we went about finding a way into the depths of the silo. Jagged edges of protruding concrete near the blast door revealed numerous entry points piercing a large area of raised earth between two silos. Ducking under thick cement slabs, we entered the labyrinthine corridors leading to the dark heart of Tirza. A chill breeze greeted us as we descended further, passing by empty chambers with massive semi-circular pedestals for their deadly cargo. In the unlikely event that the base survived the first round of a nuclear missile exchange, additional ammunition was kept in hardened underground storage bays. An underground missile storage room in the Tirza complex. Crawling into a small opening in the storage bay wall, we plunged into the darkness of a long-forgotten hallway. The cocktail of stale air, silence, and cold heightened our senses. As we turned on our headlamps, a long cement hallway came into view. Like cave drawings for the post-apocalyptic age, the walls were adorned with painted emergency warnings and instructions. It was easy to imagine two Soviet soldiers walking past the exact spot, remarking how their emergency equipment would save them from nuclear-assisted obliteration. Continuing down the dusty corridor, the silence was punctuated by a sudden electronic chirp, informing us that we would no longer proceed with battery life in our beloved GoPro. It was as if the apparition of a long-dead KGB officer was kindly reminding us to be OPSEC-savvy. Regretting the inability to visually document the rest of our journey, we trudged on. Before long, a fork in the tunnel separated hallways towards Silos 1-1 and 1-2 and between two equally Stygian options: Go left or go right. After negotiating one of the paths away from the command center obstructed by sand and rubble, a ray of light from topside illuminated a large chamber ahead. The first subterranean level of Silo 1-2 resembled the forlorn set of some B-rated science fiction movie. Dusty analog panels lined the tunnel ring around the silo and on the visible level below. Openings in the silo wall hinted at more levels underneath, likely housing a myriad of service shafts, heating and cooling ducts as well as the massive power feeds needed to keep the complex humming. At sundown, we returned to a neglected maintenance shop where our vehicle was parked. Our Toyota RAV4’s headlights and the slow dripping sound of rainwater reanimated the scene of a young Soviet conscript tinkering tirelessly on a mechanically unforgiving Zil truck. Driving through the cavernous bays of the motor pool, the high-beams illuminated crimson-painted instructions and diagrams on the plaster interior. Maintenance diagram of Soviet Zil truck. Observing the complexity and scale of a missile silo made it difficult to visualize how a massive SS-4 Sandal could be “surface launched” with minimal support directly from its transport vehicle (transporter erector launcher). We had to see it firsthand, so we resolved to head north into Estonia to visit a former Soviet nuclear surface launch site. We bedded down for the evening in a sleepy suburb a few miles from the Riga airport. Our overindulgence in homemade Latvian black balsam from our gracious but conspiracy-prone ethnic Russian Airbnb host caused us to have a lapse in pre-Estonia planning. The spirits went down much smoother than our host’s notions that 9/11 was an inside job, and that the world was controlled by an unholy alliance between the Bilderberg Group and the Rothschild Family. Balsam is one of many old European herbal digestifs (such as the Hungarian Unicum Zwack or more famous German Jägermeister) that local bartenders pour while joking that it’s medicine. Von Moltke’s remark on plans never surviving first contact with the enemy became applicable as the balsam proved to be a worthy adversary. Consequently, we blindly entered the deep Baltic woodlands in search of our next site. Despite our blunders, we were able to navigate to the Rohu surface missile launch base with the aid of highway historical markers and small wooden signs pointing to the local “Raketibaas.” Estonian Google Earth even embedded a geolocation marker for the base. Another sign along the way led us to an overgrown stone marker in a wooded patch of pines. We found ourselves standing in an unremarkable copse, once bloodied by an ambush of Red Army soldiers by Estonian partisans appropriately known as the “Forest Brothers.” The history of the Baltic states is checkered with occupation by Soviets and Nazis alike, each applying their own measured terror to the conquered. Some Estonians found themselves fighting in integrated national units of the SS, uncomfortably linking Baltic struggles with the brutality of the Nazis. The repulsion of the Soviet soldiers in this insignificant wood turned out to be all for naught, as the Russians would establish themselves in a larger and far more menacing presence only a few years later. Hardened concrete hangar-like structures came into view as the dense pine and scrub began to subside. Their derelict Soviet white-and-blue walls were adorned with graffiti. Vandalism at Rohu was disturbingly centered around Nazi symbolism, which may have been a deliberate slight against Russian neo-nationalism under Putin or a testament to the region’s problematic Neo-Nazi activism. Recent violent crimes carried out by Neo-Nazi groups specifically in Tartu even prompted concern from the United Nations Human Rights Council. Nazi symbolism has been banned across the Baltics for the past decade, and it seems the hammer and sickle will be barred from public display throughout Estonia, despite backlash from the Russian Federation. Signs of city life became evident as we drove into the formerly “closed city” of Tartu, which contains the country’s prestigious classical university founded in 1632. Tartu’s close proximity to Raadi Airfield, a Soviet heavy bomber base, resulted in the university town becoming a closed city. The movement of its citizens were restricted and foreigners were prohibited from staying overnight (even visiting university lecturers). Tartu has long shed its Soviet past, and is now home to the Baltic Defense College, a multinational military school that regularly hosts NATO senior leadership courses. Over a few pints of Saku beer, we discussed the adventure ahead in an 18th century gunpowder bunker-turned beer restaurant. Built by the Russian Empire during the reign of Catherine the Great, the cellar once held enough munitions to level Tartu University above. Thankfully for us, the gunpowder had been traded for beer two centuries before, presumably enough to keep the college students sated (or at the very least, two road-weary intelligence officers). A fortnight and nearly a thousand kilometers later, our meandering through the Baltics led us to the picturesque city of Klaipeda, a medieval port that found new life as a seaside resort popular with Soviet apparatchiks in the 1950s. An evening walk led us a long file of Lithuanian minesweepers and patrol vessels, arranged in impressive parade, yet lazily bobbing in the water with no souls aboard. On the pier beside them were elderly fishermen quietly waiting for their catch, hardly fazed by the city’s “Black Ghost” sculpture menacingly climbing out of the frigid waters. En route north towards Riga, we rushed through the shadowy Baltic countryside and veered off at a junction of rails and roads called Jelgava for one last discovery. Multiple intelligence sources (Google Earth and our now indispensable Latvian urban exploration website) indicated that the Soviet surface launch base of the 307th Regiment of the 29th Missile Division was located nearby, oddly sharing the same GPS coordinates as an inn registered on Google Maps strangely named “Zalite New Polygon.” Debating whether we were about to stumble into a new-age cult compound, we decided it was worth the risk and traversed narrow country roads between barren potato fields until the dirt track transitioned to concrete slabs; a reminder we were nearing our prize. Steep mounds of grass-covered earth broke the continuity of flat wooded countryside, with each hangar placed methodically a few hundred meters past the last. We navigated our SUV through the massive concrete door frames of each hangar, and had enough space inside to do a few doughnuts (which may have resulted in a 28 Euro fine for a dented muffler). Despite the hangar’s size, two massive transporter erector launchers (TELs) would have been a tight squeeze considering they had to transport and launch a missile over 20 meters long. A TEL and missile storage hangar in the Jelgava surface launch complex. Under the 1987 Intermediate-Range Nuclear Forces (INF) Treaty between the United States and Soviet Union, many SS-4 Sandal and SS-20 Saber missiles were ordered to be destroyed along with their transporter vehicle, missile erector, launch stand and propellant tanks. Jelgava was designated as a Soviet missile elimination site, which explained the rusting hulks of demilitarized hardware littering the base. Luckily for us, the warheads were removed from each missile before on-site eradication. The short winter days reminded us that our time to explore Jelgava was growing short, and we drove through the main checkpoint one more time, admiring the monochromatic mosaics adorning the perimeter wall. And in true Baltic fashion, a territorial German Shepard appeared in time to angrily chase us down the forest road. An old babushka pedals her worn out bicycle past us, wheels and joints straining from years of use. Missile sites like Tirza, Rohu and Jelgava may have been deactivated for over two decades, but the specter of the Cold War still casts a shadow over the Baltic States. The decaying stone and rusting metal of Soviet military might stand silently in forgotten parts of the Baltic countryside, as leaders in Tallinn, Riga and Vilnius publicly and privately express worry about a resurgent Russia with aspirations similar to its communist predecessor. Reflecting on this, and wanting to see for ourselves the border where a Russian incursion might occur, we mapped a journey to an Estonian city where NATO ends and Russia begins: Narva. Adam Maisel is a military intelligence officer in the Army National Guard and veteran of Operations Enduring Freedom and Freedom’s Sentinel. Previously, Adam served as a legislative assistant for the National Guard Association of the United States. The opinions expressed are his and his alone. Will DuVal is a recent graduate of Santa Clara University and an Army Reserve Military Intelligence Officer assigned to the 304th Information Operations Battalion in northern California. He graduated with a Bachelor of Science in political science and international affairs with a minor in German studies, and has worked with the Truman National Security Project, U.S. Mission to NATO, and Office of the Assistant Secretary of Defense for Public Affairs as an intern.